opened to the general public). In honor of the event, Dave was later rewarded with lifetime passes (which he continues to receive in installments every year). "Each January I eagerly await the arrival of the next installment of the pass which is then good for another year at any Disney park, and I have received these annual passes since 1955. At the beginning it was just a paper or cardboard pass and for years it was silver. 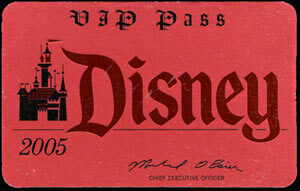 In recent years it has been red in color and is made like a credit card and says on the front "VIP MAIN ENTRANCE PASS." The reverse side has my name and says: Admit Passholder and 3 Guests." The photos above are stills from a color newsreel shot on Monday July 18, 1955. 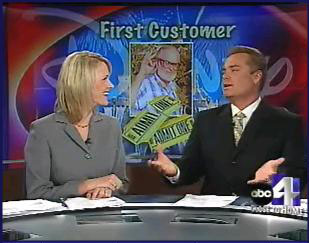 A Salt Lake City television station (pictured left) aired the rare footage in 2005 when they featured a story about Dave MacPherson (who at the time lived in Utah) and the 50th anniversary of Disneyland. This Day in Disney History would like to thank Mr. Dave MacPherson ("The Ghost of Disneyland Past") for his generosity and input in creating this page. "I decided I wanted to be the first in line. 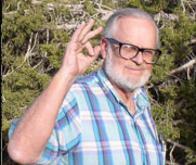 The first person to go into the park who wasn't a relative of Walt's or some celebrity. The first regular guy to go in through the front door." 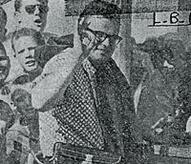 Dave's journey into Disney history began on Sunday July 17, 1955. 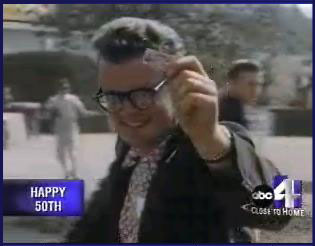 That was the day Disneyland debuted to invited guests and like many viewers across the country, Dave (at the time a student at Long Beach State College) watched the festivities on ABC-TV. So around midnight Dave got on his motorbike and made the 10-mile trek from Long Beach to Anaheim. 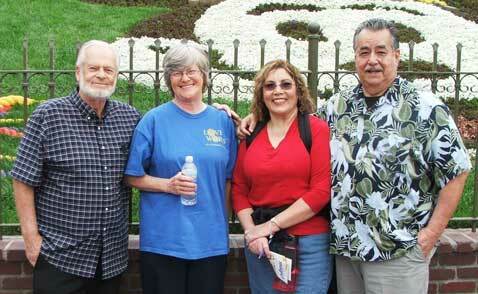 When he reached Disneyland, he walked over to the nearest ticket booth and started a line. 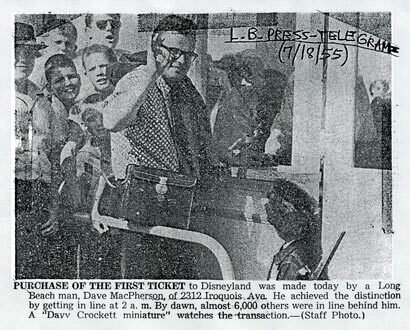 When the sun came up on the morning of July 18 Dave purchased the first ticket to be sold to the general public - thus becoming the very first person to enter Disneyland on its very first regular day in business. "Back then, folks would pay for admission and then buy books of tickets for various attractions. 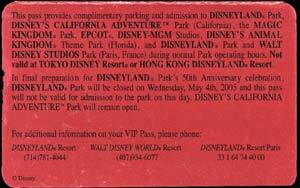 I don't know what happened to the admission ticket for which I paid a dollar. But at the same time I was given this card." 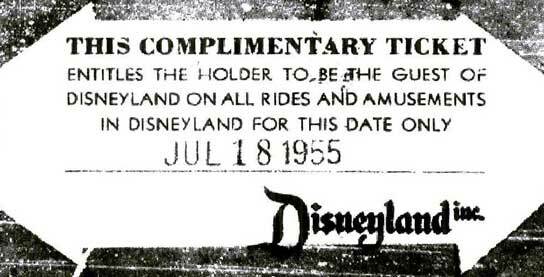 Because he had to get back to Long Beach, Dave didn't get to use this complimentary card on any ride or amusement that first day at Disneyland. Today he doesn't know where this exact card is ... the image above is actually from microfilm that he luckily preserved a copy to during the 1980s. One of Dave's biggest regrets on that July 18th was that he didn't get to shake Walt Disney's hand. After his welcoming comments and just before the gate opened on that first day, Walt put on a disappearing act - probably to avoid the stampede of excited first-day Mouseketeers. 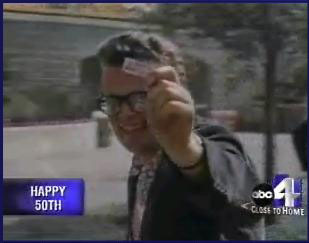 When using his VIP pass, Dave has to always show photo ID and as a back-up ... carries some photocopies of a page in his scrapbook containing "first day"clippings from papers in L.A. and Long Beach proving that he indeed bought the first ticket. "It isn't unusual, after I give a copy of that scrapbook page to anyone manning the entrance gate, to have that official shout to the crowd "Folks, this man bought the first ticket to Disneyland when it opened in 1955." You can't believe how many folks from different parts of the world have then come over and asked for my autograph or shot a picture of my wife Wanda and myself!" but they still visit the Happiest Place on Earth every chance they get.